Andrew has been a Registered Psychologist since 2014 and is a Member of the Australian Psychological Society and the Australian Association for Cognitive and Behaviour Therapy. He has varied experience in multiple tertiary and community mental health settings including the Older Persons’ Mental Health Service and the Interdisciplinary Persistent Pain Centre at Queensland Health, and the ARC triage team of East Melbourne Medicare Local. In these roles, Andrew worked with individuals with complex and acute mental health concerns and has since been engaged in private practice for several years. Andrew is passionate about using evidence-based strategies to empower his clients to improve their lives, and he offers a warm and collaborative approach to counselling. To achieve this, Andrew draws on a range of therapeutic modalities and tailors his approach to suit each individual’s unique needs. Andrew is a firm believer that all people are capable of change when supported to challenge self-limiting thoughts and beliefs in an empathetic and nonjudgmental space. Ultimately, Andrew works closely with his clients to resolve longstanding patterns of behaviour which may be interfering with the ability to live a full and meaningful life. Andrew has extensive experience in treating a wide range of presenting issues and has particular interests in the application of mindfulness-based interventions, working with clients with chronic health conditions or persistent pain, older adults with complex needs, and academic and work-related stress. He has completed post-graduate dissertations on the impact of cross-cultural masculine norms and social stigma on professional help-seeking in men, and on the use of mindfulness-based practices to cultivate resilience. 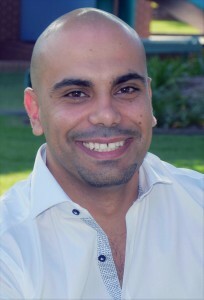 He has a Bachelor of Science and Post Graduate Diploma in Psychology from Monash University and a Masters Degree in Clinical Psychology from Bond University. Andrew is currently completing a PhD in the area of clinical neuropsychology, investigating a Montessori approach to dementia-based respite care at Southern Cross University. Andrew is available on Tuesdays and Thursdays at our Canterbury office.